Members of the media who'd like a press pack of MUTDUT MultiCinches to review please email contact@mutdut.com. For all other inquiries about our company please email our founder, Scott, at scott@mutdut.com. 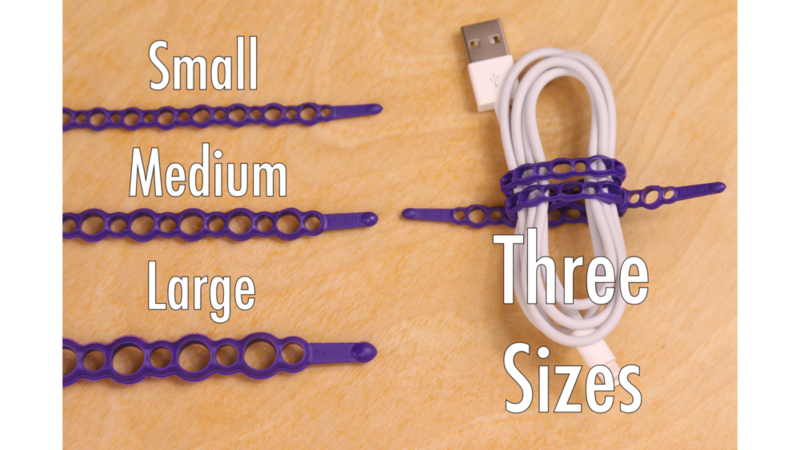 MultiCinches are reusable, elastic, strong and versatile tools that can bundle, organize, fix, and build. They're symmetrical and reversible, secure and reusable and lots of fun to use. The MultiCinch is made from a custom material blend that's tough and outdoor ready but soft and easy on the hands. And the unique, patent-pending design gives it an incredible level of versatility and usefulness. The MultiCinch comes in three sizes: small, medium and large, that all work and fit together so you can always make what you need at a moments notice without any planning or measuring. The Basic Bundle, which includes two of each size, is being offered on Kickstarter for $16, with discounts for backers who order multiple bundles. The project's stretch goals include bonus MultiCinches and backers can potentially get double their initial order at no extra cost. People who just want to try MultiCinches can get a mini-pack of three MultiCinches for just $7, though the mini-pack is not eligible for bonuses. Designed and made in the USA, the MultiCinch is being offered to Kickstarter backers at an incredible value before they appear on store shelves and online retailers later this year. Please click the button below to download a zip file of MultiCinch pictures and logo files.